Discover the freedom of open roads with Lonely Planet Grand Tour of Italy Road Trips, your passport to encountering Italy by car. Featuring four amazing road trips, plus up-to-date advice on the destinations you'll visit on the way. Follow the trail of bohemians and intellectuals from hedonistic... read more beach towns to Renaissance jewels, all with your trusted travel companion. Get to Italy, rent a car, and hit the road!Inside Lonely Planet Grand Tour of Italy Road Trips : Lavish colour and gorgeous photography throughout Itineraries and planning advice to pick the right tailored routes for your needs and interests Get around easily - easy-to-read, full-colour route maps, detailed directions Insider tips to get around like a local, avoid trouble spots and be safe on the road - local driving rules, parking, toll roads Essential info at your fingertips - hours of operation, phone numbers, websites, prices Honest reviews for all budgets - eating, sleeping, sight-seeing, hidden gems that most guidebooks miss Useful features - including Detours, Walking Tours and Link Your Trip Covers Turin and the Riviera, Genoa, Venice, Padua, Florence and Tuscany, Rome and Lazio, Naples and more The Perfect Choice: Lonely Planet Grand Tour of Italy Road Trips is perfect for exploring the classic sights of Italy via the road and discovering sights that are more accessible by car. Want to have a full-fledged Italian road trip? Check out Lonely Planet Italy's Best Trips for road trip itineraries that will give you a taste of what the whole country has to offer. Or looking to road trip in other Italian regions? 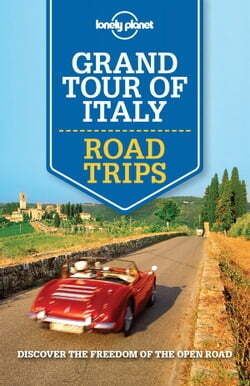 Check out Lonely Planet's Amalfi Coast Road Trips, Italian Lakes Road Trips, or Tuscany Road Trips. Planning an Italian trip sans a car? Lonely Planet Italy, our most comprehensive guide to Italy, is perfect for exploring both top sights and lesser-known gems. Looking for a guide focused on a specific Italian city? Check out Lonely Planet's Rome, Florence & Tuscany, orVenice & the Veneto guides for comprehensive looks at all that these cities have to offer, or Pocket Rome, Pocket Florence & Tuscany, Pocket Venice, or Pocket Milan & the Italian Lakes, handy-sized guides focused on the can't-miss sights for quick city excursions. There's More in Store for You: See more of Europe's picturesque country sides and have a richer, more authentic experience by exploring Europe by car with Lonely Planet's EuropeanBest Trips guides to France, Ireland, Spain & Portugal and Germany, Austria & Switzerland or Road Trips guides to Chateaux of the Loire Valley, Normandy & D-Day Beaches and Provence & Southeast France. Authors: Written and researched by Lonely Planet, Cristian Bonetto, Duncan Garwood, Paula Hardy, Donna Wheeler and Nicola Williams. About Lonely Planet: Since 1973, Lonely Planet has become the world's leading travel media company with guidebooks to every destination, an award-winning website, mobile and digital travel products, and a dedicated traveller community. Lonely Planet covers must-see spots but also enables curious travelers to get off beaten paths to understand more of the culture of the places in which they find themselves.